Currently, approximately half of all new passenger cars being registered in Western Europe are diesel powered, and the diesel sector is growing rapidly here in Australia. 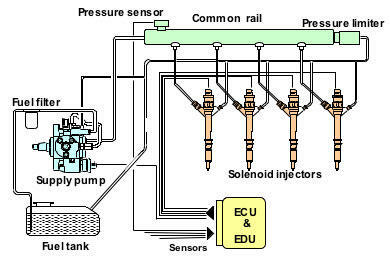 Modern Common Rail Diesel engines utilise fuel pressure of up to 44,000 psi, providing greater fuel atomisation, with injection controlled by piezoelectric valves, providing precise control, with up to 5 injection events, per cylinder, in a single combustion event. These technological advances result in quieter, smoother, cleaner operation and improved fuel & performance efficiency over mechanical diesel engines. CoolDrive EFI is an authorised major distributor for Bosch and Zexel diesel components, and also carries a wide range of diesel products from major suppliers, such as Delphi and Denso, and many others. Fuel rail pressure sensors, MAP/boost pressure sensors, crank- and camshaft sensors. Bosch and their Japanese diesel subsidiary, Zexel, have an international team of over 52,000 diesel specialists. The Diesel Systems Division develops, applies and manufactures technology which contributes to making diesel vehicles more environmentally friendly, and more economical. CoolDrive EFI stock and distribute a large range of Bosch and Zexel Common Rail Diesel Injection Products to suit a wide range of vehicles and applications. CoolDrive EFI also stock and distribute a comprehensive range of Denso Common Rail Diesel Injection Products to suit your needs, covering vehicles such as Toyota Hilux and Landcruiser, Holden Rodeo, Nissan Navara, Ford Transit and many more. CONTACT COOLDRIVE EFI TODAY FOR ALL YOUR DIESEL PRODUCT NEEDS!